Using Firefox Password Recovery, you can easily see the actual passwords that are stored by Firefox / Flock / SeaMonkey, and regain access to all the saved login information (including the website, username and password), and even decrypt passwords protected with a Master Password. In addition, this program also allows you to retrieve email account passwords from Mozilla Thunderbird. Recover passwords and logins stored by Firefox Web Browser. Recover saved email passwords from Thunderbird. Support all versions of Mozilla Firefox and Thunderbird, including the latest version Firefox 64. Updated! Recover all the login passwords from Flock, SeaMonkey Web browser. New! Reveal all your saved passwords from Firefox, Firefox ESR and Thunderbird, even if your Firefox is crashed or hang. Screenshot 1: Recover logins and passwords stored by Firefox/Flock/SeaMonkey and Mozilla Thunderbird, reset Firefox Master password. Screenshot 2: Decrypt the stored passwords from Firefox, Thunderbird, Flock and SeaMonkey profiles. Firefox allows you to save the passwords you use to log in to website. The next time you visit the website, Firefox will automatically enter your username and password in the appropriate location for you. However, no one can guarantee that your Firefox won't become inaccessible or non-functional. No one can be insured against forgetting the password! There are many other situations you need Firefox Password Recovery program. When you try to get your email through Thunderbird, it is now asking you for your password, but you have forgotten it, it has been so long since you have been asked for it. Often we'll use the saved password feature so often that we've completely forgotten our password when we need to login to the same website on another computer. You decided to put a password onto your saved passwords and must have typed it wrong because the password you thought you'd typed in doesn't work. You have been using thunderbird to connect to GMAIL for quite some time. So long in fact, you have forgotten what your password is. You can still use your email since thunderbird automatically logs in, but you can't login to gmail account from gmail.com website because you can't remember password. "I updated to Firefox 3 yesterday, but found that all my saved passwords just don't copy into my new profile for some reason. 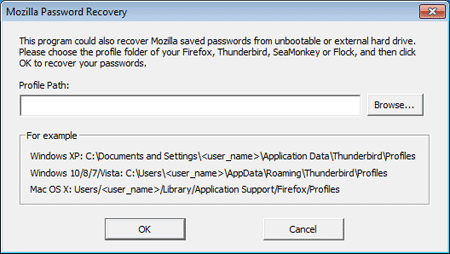 Fortunately, Firefox Password Recovery provides an easy way to view my passwords from old profile, saving lots of time and memory-wracking..."
"My hard drive crashed a few days ago and I just use Firefox Password Recovery tool to regain access to all my passwords saved in Firefox." "I was successful in getting my lost passwords. Thank you the software works great." 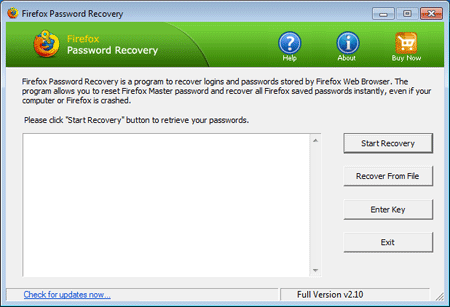 Learn How can you recover Firefox saved passwords easily with Firefox Password Recovery.